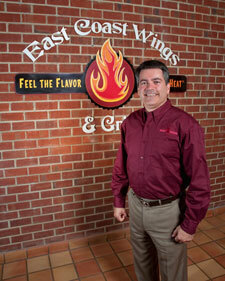 Sam Ballas waxes eloquently--and passionately--about East Coast Wings & Grill, the company he acquired in 2001. As CEO, he preaches the product's quality and the menu's diversity, lauds the devoted team of professionals he's assembled in the corporate office, and talks about his careful system growth strategy that emphasizes quality over quantity. But he sums up the brand best when he says, "We get it. Franchisees first, then corporate success will follow." Ballas grew up in a Greek immigrant family that operated restaurants. "By the time you were 12 years old, you were shoved into a restaurant busing tables or running a cash register," he recalls. But he also was learning how businesses operate. His parents wanted him to go to college and have a better life than they had. Ballas did just that, but says, "The restaurant is bloodline to me." His college years revealed a love and understanding of numbers. That led to investment banking jobs with American International Group Inc. and Interstate/Johnson Lane Securities. Ballas was always looking for opportunities, and before long he found himself involved in "side businesses" that included real estate and development. One such side business was investing in a startup wing restaurant company called East Coast Wings & Grill. He eventually bought out his partners, learned all he could about the franchising model, wrote his own UFOC, rebranded, and dove into franchising in 2003. His credo, he says, is always to consider the franchisee first. "I'm a micromanager and I like to say I manage from the outside in," he says. "I'm always looking at how I can help the franchisee be more successful because that's going to make us all successful." He speaks of communication, transparency, ongoing support, and training--all buzzwords, but as he says, "It's often tougher to do this than it is to say you're going to do it." Today, Ballas is overseeing a conservatively growing brand that has 23 units open, 11 more under construction, and more than 90 sold. His strategy boils down to one successful unit at a time, and he says his franchisees are leading the sector with an average 19 percent EBITDA. He's so dedicated to seeing his franchisees succeed that he recently created a new position: director of unit level economics. It's an innovative move that demonstrates his dedication to assisting his franchisees in reaching their maximum potential. "It's really a game-changer and, I like to say, an epiphany for CEOs who realize you should really be investing in the thing you say is the most important part--the franchisee." Years in current position: Coming from a Wall Street, commercial real estate, and lifelong restaurant background, I invested in the brand in 1999 and bought out the concept in 2001. In 2002 we rebranded, and in 2003 we sold our first franchise, which opened in 2004. Having developed my career path from highly regulated industries, I am a micromanager. I spend lots of time with my corporate team supporting their development. I also spend ample time with our franchise system, helping our franchisees build their business. I get it: support my chosen management team and our franchisees as the vision of the brand unfolds. "Never be satisfied." This means I instill a philosophy with my team that every day offers new challenges, and every day we can get better at what we did yesterday. I was born to immigrant parents who arrived in the USA at age 12, and I lived the dream of watching my parents build a business without an education and funding. I was able to watch them better their business day after day. I allow my team and support staff room to function, to do their duties and develop their departments/divisions. I find myself in their space more than I should be. It's the hands-on in me, I guess. Our/my message is consistent throughout our system: Never be satisfied, franchisees are our lifeline. A formal education is a good way to start. But I will yield, in my experience, and take OTJ experience over an MBA degree all day long. The ability to deliver results is faster with OTJ experience hires. I feel the CEO should have debated all the necessary facts and issues with any tough decision and react accordingly. In our world at East Coast Wings & Grill, when it comes to franchisee changes, I like for there to be a voice from our franchisees. Many times if an issue affects the franchisee, especially their EBITDA, we will call a Franchise Advisory Council meeting for further discussion. Assure your vision is attainable with the correct management team hires. Develop trust, transparent and clear communication among your team and franchise system. Ultimately, you are as good as your system's delivery of results. I view myself as the coach of the team, empowering my assistant coaches (management team) with calling the plays from the brand's playbook. As my team performs, I spend time balancing the need for directing the team and supporting their ideas... ultimately enhancing their development and the brand's ability to serve our franchisees. I picked terrific people. As the brand began to grow, I looked for people who enhanced my ability to deliver the vision for East Coast Wings & Grill. They are extremely efficient, loyal, and understand what we do. The team understands the basis of our existence, It makes it easier in holding accountability and they in turn accept the liability of performance. Favorite management gurus: Do you read management books? I read quite a bit. I prefer business-style autobiographies, like Winning from Jack Welsh, and I enjoy authors like Patrick Lencioni. Every time a franchisee reports their P&Ls and they are in line with the brand's metrics. I am a CEO of a franchise model. Seeing the model perform is our validation and inspiration to grow. 7:30-7:45 a.m. I get a ton of work done by 9 a.m. After 9, I am visiting my department heads. No. I usually spend 2 to 3 days a week in the late afternoon. Occasionally. In many of these occasions, I will spend some time with a team member or two and talk about some corporate strategy. The Advantage by Patrick Lencioni and Onward: How Starbucks Fought for Its Life without Losing Its Soul by Howard Schultz and Joanne Gordon. Boy, I could do this better. It gets tricky, as my wife, Fay, is our director of human resources. So our home time sometimes extends our workday. At minimum, I try to save the weekend for family time, even though being a restaurant concept we have our biggest sales over the weekend, so I do get calls from time to time. I communicate with my team daily. I specifically send notes on performance-based action. A new position, director of unit-level economics/QA. This is the brand's statement, the brand's investment in our philosophy in driving unit-level economics: a full-time director salary assisting our franchisees with driving the bottom line-EBITDA. This director will also hold our preferred vendors and suppliers accountable in serving our franchisees and system. Keep opening 12 to 15 new units per year by recruiting top-tier franchisees, and supporting them in developing the brand nationwide. The recession had a positive effect on the company. It allowed us to secure favorable cost of goods pricing, as well as manufacturing of goods opportunities. We shot to the top of our sector in unit-level economics. From 2009 to 2011, same-unit operations grew their EBIDTA by 58 percent (these are units with full operating years). Our real estate executive also drove landlord tenant improvement contributions to levels in many cases as high as $32 a square foot, while decreasing rent rates by 12 percent a square foot (we nicknamed her the "Honey Badger"). Going forward, we drive by bottom-line delivery on the unit level and by providing our patrons an exceptional dining experience. We will continue driving these points. The brand is SBA registered and we have funding available through The Bankcorp Bank through Franchise America Finance; we received approval for $7.5 million for franchisee development. East Coast Wings & Grill Corp. pays the origination fee for approved franchisees with the Bankcorp facility. Bottom line, EBITDA on the unit level, ancillary to the corporate level. There is no "us vs. them" in our franchise system. Our franchisees know their ECW corporate team works for them first every day, managing from the front lines first. With this said, I do understand the balance of team/personnel development, franchisee development, etc. In a business, bottom line assures another day. There are many business successes I could share. Building a franchise system from a single store is a great achievement. At the end of every day, my family is my greatest story. Sixty percent new unit growth. Sustaining the top position of unit-level economics in our space. The continued evolvement of our menu selections assuring market share growth in sales, thus sustaining a positive same-store sales growth story.